This festive season join expert taxidermist Sherene Scott for the unique opportunity to learn a real Victorian art form and go home with a beautiful handmade Christmas decoration. 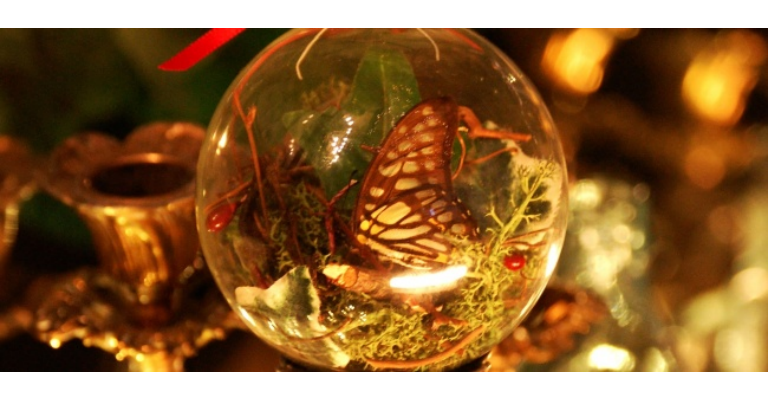 After learning the specialist skill of butterfly pinning, you can then select from a stunning collection of homegrown and specially-preserved seasonal foliage to create a beautiful bauble decoration to be cherished for Christmases to come. Using only the highest quality and most ethically-sourced materials, by the end of the class you will have created a one-off piece to either add to your own collection or give as a special gift, as well as additional preserved specimens to take home and create further pieces with your newly learned skills. Fun and informal, this is the perfect class to get you in to the Christmas spirit. Please note, all specimens have been obtained after dying of natural causes in ethical butterfly farms.